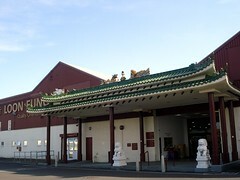 Loon Fung was a large Chinese cash-and-carry on an industrial estate in Silvertown. It closed down some time in 2017. The information below is retained for historical purposes. Large Chinese cash-and-carry on an industrial estate in Silvertown. As well as many aisles of Chinese groceries (vinegars, soy sauces, preserved vegetables, noodles, spices, etc), they also stock smaller selections of Japanese, Thai, and other Asian groceries. There's a large vegetable section including more unusual things like pandan leaves, fresh lotus seeds, fresh water chestnuts, many kinds of greens and gourds, and garlic by the 4.5kg bag (and smaller bags too). Prices are pretty good (as of April 2010, you can get four bulbs of garlic for 75p and three large aubergines for just under £2). Next to the vegetable department is an extensive freezer section with many kinds of frozen dim sum. A smaller refrigerated section has things like fresh, fried, and dried tofu; in April 2011 it also had the flat, flexible beancurd sheets that are used e.g. as pancakes for 京醬肉絲/shredded pork in Peking sauce. Along the back of the store are fresh fish and meat counters. In March 2011, the offal selection included pork heart, liver, and tongue; and chicken gizzards and hearts. Cooked meats such as roast duck and roast pork are also available from this section. A hardware section carries chopsticks, hotpot strainers, steamer doilies, and other such items. It's worth noting that the displayed prices don't include VAT. For many of the things sold here this doesn't make any difference, since food is generally zero-rated for VAT; however, snacks, confectionery, alcoholic drinks, and certain other items are liable for VAT, and this will be added on top at the checkout. Accessibility: Carpark outside, shallow ramp to get in, aisles are nice and wide. Last visited by Kake, April 2011. Last edited 2018-07-13 09:25:04 (version 7; diff). List all versions. Page last edited 2018-07-13 09:25:04 (version 7).